As of last year, you no longer have to wait in Leopold’s ever-present line or even be in Savannah to enjoy its famed frozen hot cocoa or tutti-frutti. Stratton and Mary Leopold recently expanded the local institution, launching an off-site creamery that ships pints and soon opening a second shop. Still, nothing beats the in-parlor experience of an oversize ball of Chocolate Chewies & Cream dripping down a sugar cone at the Broughton Street flagship. 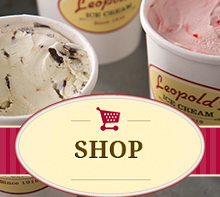 « Leopold’s Ice Cream Announced the 8th Annual Creative Writing Challenge!